HCM CITY — An ageing population is posing mounting challenges to providing care for elderly people in Việt Nam. However, in a country where most families look after old parents in their own homes, the idea of a ‘nursing home’ or geriatric centre remains an alien concept. HCM City, the bustling economic centre of Việt Nam, is not an exemption to the rule, leading to a lack of quality geriatric care facilities for those most in need. Thanh Tâm had married and lived away from her parents for more than 20 years, however, when her father broke his legs, she decided to return home to District 10 to take care of him. At first, her father remained in good health and spirits, living happily with his offspring. However, in the last three years, his health started to visibly decline while Tâm’s workload increased. She hired helpers to take some of the burden of caring for her father, but one by one, they stopped working after just two or three months each. Left with little choice, Tâm was forced to send her father to a nursing home. It was not an easy decision. Minh Đường, a resident of District 3, is facing a similar predicament, and is looking for a suitable nursing home for her aunt. Đường’s aunt has been living alone for several years after her sole son passed away in an accident, but recently her health began to deteriorate and she expressed a desire to live in a nursing home – which will provide both daily care and constant companionship from other elderly residents. In Việt Nam, where the idea of ‘tứ đại đồng đường’ – literally translated as four generations living under the same roof – remains not just a common saying but a ‘dogma’ to live by, the sending of grandparents or elderly relatives to nursing homes could be seen as irresponsible, a failure to perform filial duty, or a lack of respect for elders. However, in recent years, especially in urban areas, it’s no longer as outrageous a decision as before and is starting to be viewed more acceptingly. Real life cases show that, once the psychological issues of having to live apart from their children or grandchildren have been overcome, the quality of life for elderly people in nursing homes might actually see unexpected improvements. Thanh Tâm said after a year in the nursing home, when things started to settle for her father, his health – both physical and mental – has been growing much more stable, reassuring her that she has made the right, albeit difficult, choice and provided her with mental support to ward off others’ objections. According to Trịnh Thị Hiền, an expert from the HCM City Institute for Development Studies, the trend of sending elderly people to nursing homes will continue to grow due to the rapidly ageing population. People above 60 years old currently account for 10 per cent of the total population, and this is expected to rise to 17 per cent by 2030, translating to 16.5 million people. “Ceding the care of their parents to nursing homes does not mean entirely relinquishing their filial duties, and society needs to be more open-minded about this issue,” Hiền said. However, the number of nursing homes in the city remains too low, according to Châu Minh Tỷ, head of HCM City’s Association of the Elderly. Currently, there are three forms of nursing homes in the city. First, public nursing homes, which are only capable of accommodating around 2,000 people, with the largest one being Thạnh Lộc nursing home for disabled elders in District 12 currently providing care for 300 people. The second form of nursing homes are the nine provided by religious and charity organisations, however, they are mostly small and their operations depend entirely on donations. 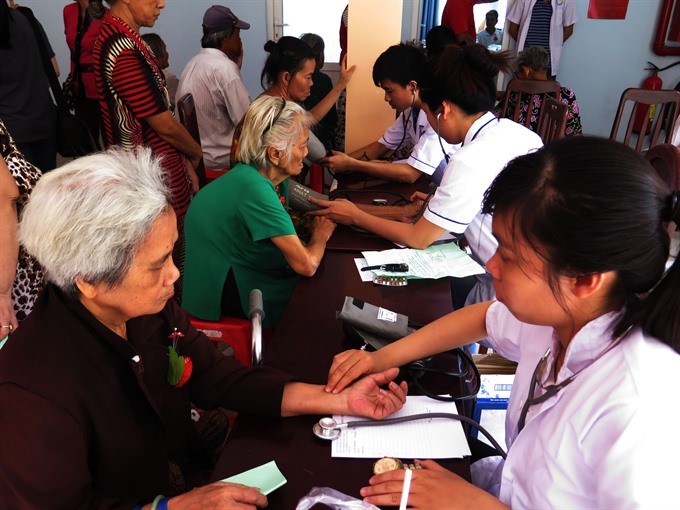 The third type are private nursing homes, most notably the Kinh Đông centre and Bình Mỹ home in Củ Chi District, however, due to the high costs associated with better facilities and services, there are not many residents in these centres. While the state budget allocation for geriatric care remains limited, priority is placed on elders without relatives, disabled people, or poor ones. In order to cater to elderly people from other walks of life in society, encouraging private investment into geriatric care is a necessity, according to Trịnh Thị Hiền. As the first private nursing home in HCM City, Ba Thương centre opened in 2007 and aimed to achieve “European standards” with green spaces, thorough services, and decent infrastructure. However, due to its high costs, for a long time, only overseas Vietnamese and a few high-income families sought their services, so the centre could barely stay afloat. Later, it changed its name to Kinh Đông resort village, opening up more services to include even short-term and long-term tourists, but the business still didn’t see any sign of improvements. A late successor to the Kinh Đông resort, but due to its application of nursing home standards in Japan – the country whose ratio of elderly population is thought to eclipse all other countries – and a more affordable price, Bình Mỹ nursing centre in Củ Chi District is the only private nursing home still operational in HCM City. At the moment, the centre is taking care of 200 seniors for a monthly cost of around VNĐ8 million (US$350) each. Bùi Anh Trung, director of the nursing home, said it also received those suffering from complete paralysis or terminal diseases. "Acceptance of these ill elderly persons is really risky as the home faces potential lawsuits from any incident during their stay here, but we can’t turn away these customers, or there’s no one else [to take care of them],” Trung said. Due to high investment and the high risk nature of the service, there was a time when several private nursing homes sprouted up only to close down before long.